Guided tour of Clifden’s early industrial area.Meeting point: Ardbear Old Bridge, the waterfall, Clifden. Rediscover Clifden’s early industrial history with Kathleen Villiers-Tuthil and learn about the towns first entrepreneurs and their attempts to establish legitimate industries in the face of stiff opposition from smugglers and poitín makers. Explore the Flora, Fauna and History of the Marconi Station, Derrygimhla. Join Carole Reynolds and Breandan O Scanaill from Connemara National Park as they look at the Flora, Fauna and History of this unique site south of Clifden. Meeting point; Public Car Park behind Tourist Office, Galway Road, Clifden. Living Stones – Gleann Aoibheann. Join Breandan O Scanaill, in exploring the history of this 1830’s home, using documents and photographs, he will illustrate the life of the various owners. Meeting point; Gleann Aoibheann, Beach Road, Clifden. Living Stones – Saint Josephs Church. Fr. James Ronyane will guide you around this mid 19th century church. He will talk about the various priests associated with the church. The church is known for its fine stained glass and decoration, from the Clarke Studios in Dublin. Meeting point; St Josephs Church, Westport Road, Clifden. Explore this end of the line Railway Station, beautifully restored. The original station, station masters house, engine shed, good sheds, water tower and coal store can still be seen. Great selection of railway posters. Meeting point; Station House Hotel, Galway Road, Clifden. 20.00 – Talk at Connemara National Park. Exploring the history of Connemara through Postcards. Breandan O Scanaill will use his extensive postcard collection to explore the history of Connemara. Meeting point. Audio Visual Theatre, Connemara National Park, Letterfrack. Thursday 27th August – 12.00 noon. Living Stones – Christ Church. A visit to Christ Church and graveyard. Join Rev. Stan Evans as he tells the history of this mid 19th century church, , with its fine organ and memorial tablets. Explore the graveyard with the tomb of John D’Arcy, founder of Clifden. Meeting point; Christ Church, Church Hill, Clifden. Join Sheila Griffin as she looks at the history of this 1820’s home which served as a post office and a doctor’s home. Interesting stables and outhouses behind the house. Meeting Point; Seamist, Sea View, Clifden. Mountain and explain what they aimed to achieve. It will finish at the little known station building which is still standing at the foot of the mountain where the 1st Duplex signalling was achieved on the 4th July 1911. Meeting point Front door of Connemara National Park, Letterfrack. Bring walking boots and rain gear for all outdoor events. 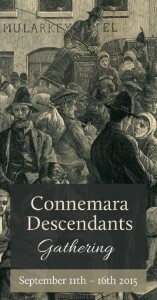 The history and heritage filled town of Clifden will host the Connemara Descendants Gathering from Friday 11th – Wednesday 16th September, 2015. The gathering will be officially opened by Cllr. Peter Roche, Cathaoirleach, Galway County Council. All Connemara descendants are invited to come to Clifden to celebrate their heritage in what will be a gathering full of interesting talks, walks, exhibitions, genealogy research and cultural celebrations.